We head into the All-Star Break with our second oddity of the weekend, this time a Case Play that asks what happens when an airborne fielder and runner collide on the base paths—interference or obstruction, block or charge? 3B Umpire Shane Livensparger signals "safe." The Play: With one out and two on (R1, R2) in the top of the 9th inning of a 9-0 ballgame, Yankees batter Didi Gregorius hit a ground ball to Orioles third baseman Jace Peterson, who threw to second baseman Jonathan Schoop as Peterson collided with Yankees baserunner R2 Clint Frazier. Schoop successfully forced out R1 Aaron Judge at second base, but Gregorius beat out the ensuing throw to first with Frazier taking third, as replays indicate Peterson did not tag him. Case Play Question: When Frazier and Peterson collided between second and third base, umpires considered whether the former interfered with the latter, or whether it was the fielder who obstructed the runner. 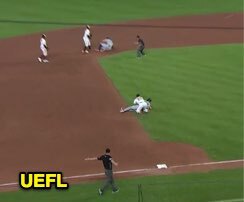 Replays indicate that immediately following the collision, 3B Umpire Shane Livensparger indicated "safe" (no tag, no interference, no obstruction) as 2B Umpire Chris Guccione turned to officiate the force and bona fide slide play at second base. Is this obstruction, interference, or nothing (or both)? What is the proper outcome for this play? Answer: This play was officiated properly. For interference to be called, the baserunner must impede a fielder's attempt to collect a batted ball or a fielder who has fielded a batted ball from throwing the ball in the immediate aftermath of fielding the ball. Because fielder F5 Peterson successfully threw the ball before his interaction with runner R2 Frazier, the logical conclusion for interference isn't satisfied and, thus, this is not interference. In other words, by the time Frazier undercuts Peterson, the ball is away and Frazier has not impeded the fielder's ability to field nor complete his throw. For obstruction to be called, the fielder not in the act of fielding a batted ball must impede the progress of a baserunner. This train-wreck of a collision would therefore satisfy the criteria for obstruction only if the runner is impeded from attempting to advance after the fielder has completed his throw of the batted ball. If the runner, as was the case here, appears to "give up," there can be no obstruction since there was no hindrance. Had the runner exhibited any effort to advance while the fielder continued to lie on top of him, this would be obstruction. As it played out, this is properly no-called: there is no interference, and there is no obstruction. That said, had the defense attempted to make a play on the downed runner at third base, the umpires (primarily U3) would have to make a call (or no-call) on F5/R2's post-collision interaction. If Frazier is under the (incorrect) impression that he is out for interference, or that he has been tagged out, and willfully walks off the field, abandonment is an additional possibility. Again, this is an intent mind-reading game the umpire must play. If the runner's attempt to advance is impeded, this is Obstruction Type 2 (no play on the obstructed runner at the time of obstruction). If he has not attempted to advance, there is no obstruction. This could theoretically turn into an Obstruction Type 1 play if, for instance, a play is attempted on the runner at third base and only upon this attempted play does the runner attempt to advance. In this case (OBS 1/A), the runner would be awarded third on the dead ball infraction. OBR 6.01(a)(6): "If, in the judgment of the umpire, a base runner willfully and deliberately interferes with a batted ball or a fielder in the act of fielding a batted ball with the obvious intent to break up a double play, the ball is dead. The umpire shall call the runner out for interference and also call out the batter-runner because of the action of his teammate." OBR 6.01(a)(10): "It is interference by a batter or runner when—He fails to avoid a fielder who is attempting to field a batted ball, or intentionally interferes with a thrown ball." OBR 6.01(h)(2): "If no play is being made on the obstructed runner, the play shall proceed until no further action is possible. The umpire shall then call 'Time' and impose such penalties, if any, as in his judgment will nullify the act of obstruction." OBR Definitions: "Offensive interference is an act by the team at bat which interferes with, obstructs, impedes, hinders or confuses any fielder attempting to make a play." OBR Definitions: "OBSTRUCTION is the act of a fielder who, while not in possession of the ball and not in the act of fielding the ball, impedes the progress of any runner." MLBUM RE: 6.01(a)(10): "If, after a player has fielded a batted ball but before he is able to throw the ball, a runner hinders or impedes such fielder, the runner shall be called out for interference."